Washington, DC, is so chockfull of significant historical monuments that even its lesser known memorials are fascinating to visit. For DC wedding photographers, they also offer beautiful and memorably Washingtonian settings for couples portraits. Each one gives brides and grooms a chance to imbue their pictures with a bit of local flavor. For fiancés and newlyweds whose love story is partially or entirely set in the Nation’s Capital, this often matters a lot. The place where a couple meets or falls in love can have deep sentimental value to them. Taking their engagement or wedding photos there adds a bit of backstory to the scenes playing out in the images. As it happened, the spouses-to-be pictured in this photograph were not from the DC area. Instead, they hailed from nearby Baltimore, Maryland. They had been to the Nation’s Capital many times, of course. As a result, they were enchanted by the idea of having their engagement portrait session in downtown Washington. Our initial plan for the shoot was to take pictures in front of glorious winter sunrise. With that in mind, we asked the future bride and groom to meet us in East Potomac Park. Located on Hains Point, an artificial island that juts into the Potomac River, this green space is a charming spot for couples portraits. It features an extended boardwalk with views of downtown DC on one side and Arlington, Virginia, on the other. In the early spring, the park is one of the premier destinations for seeing Washington’s famous cherry blossom trees. During the eponymous festival, the entire island is ringed with lovely pink and white flowers. A good Washington, DC, wedding photographer knows that the value of this spot for portraits amid the cherry blossoms. The Tidal Basin is where the tourists go for selfies. East Potomac Park gives couples just as many cherry blossom trees with half the crowds. The island’s north-south orientation makes it ideal for sunrise and sunset portraiture. Being surrounded on both sides by water means that DC wedding photographers have a clear and unobstructed view of the sky. The morning or evening clouds lit up with oranges, yellows and reds are clearly visible from East Potomac Park. Fortunately, the bride- and groom-to-be featured in this picture were happy to do a sunrise engagement shoot. They were great sports about getting up before dawn and coming to Washington! Even more fortunately, Mother Nature cooperated, and the sky lit up with a gorgeous pink and purple sunrise. We got some epic portraits of the fiancés embracing with the sky illuminated behind them. It was a Washington, DC, wedding photographer’s dream scenario! After the heavens returned to their normal hues, we brought the couple to other spots in the area for more pictures. On our way to the nearby Jefferson Memorial, we stopped at one of DC’s aforementioned hidden gems. While not as famous as some of its neighbors, the George Mason Memorial is a lovely tribute to a towering American figure. The namesake of the monument is responsible for the Virginia Declaration of Rights. That document served as a precursor for the United States Bill of Rights. Mason is one of the architects of the U.S. Constitution, but his signature is nowhere to be found on it. That is because this founding father wanted the Constitution to expressly ban the slave trade. The George Mason Memorial is a fitting tribute to a giant of American history. 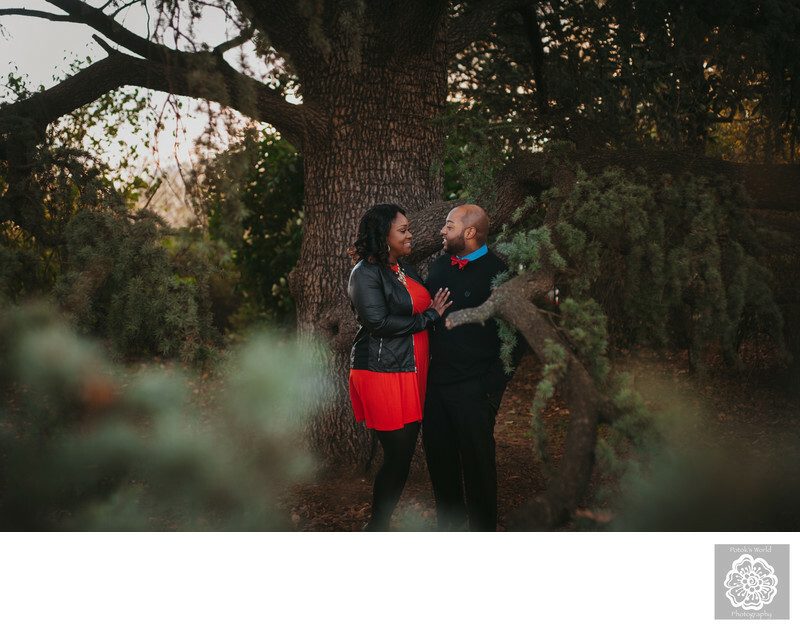 It is perhaps even better as a location for DC engagement and wedding photography. The monument is ringed by various evergreen and deciduous trees. The area is particularly lovely in the spring. At that time of year, a huge magnolia tree just outside the memorial blooms with beautiful purple and white flowers. Because it was wintertime, the magnolia tree was unfortunately not in bloom. For the shot featured here, therefore, we chose to pose the fiancés by a different tree. We found a large evergreen with twisting branches near the memorial. We thought this would make a fantastic setting for some couples portraits. Posing the fiancés near the trunk looked particularly good on film. For starters, the snaking limbs created visually pleasing leading lines that draw the eye to the couple. Second, those same branches curve around toward the camera, appearing to envelope the future spouses. This makes them appear cocooned in a private space of their own, adding a touch of intimacy to the photo. Finally (and similarly), the limbs wind around into the foreground of the image, giving the latter interesting color and depth. All told, the tree allowed for a very lovely and romantic photo of two people on the brink of getting married! Location: Thomas Jefferson Memorial, 701 E Basin Dr SW, Washington, DC 20242 .